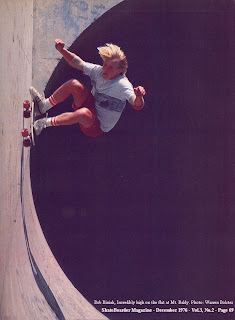 It should not come as a surprise to you that, as I was browsing the pages of SkateBoarder mag in the 70’s the Z-Boys instantly became my skate reference, changed my perception of skate forever and eventually changed me forever. I know I am not alone; millions of us were living to this special day when the mag would hit our mailbox with the cover saying “Will he make it? Look inside”. And today is a sad day because we are millions less one. No, I did not know Bon Biniak personally. No I never met him in a skate park or on a stage of Dogtowns and the Z-Boys. No I never had a picture with his autograph. I even never had one of his boards! I might have had the infamous picture at Mt Baldy on my wall for a time… Should that make my mourning softer or my pain go away faster? We are now left to ourselves with some remaining fading pictures, old destroyed mags, a couple of movies to remember the days and a bleeding heart. Further reading: Glen Friedman, Juice.